And have one with me wandering." 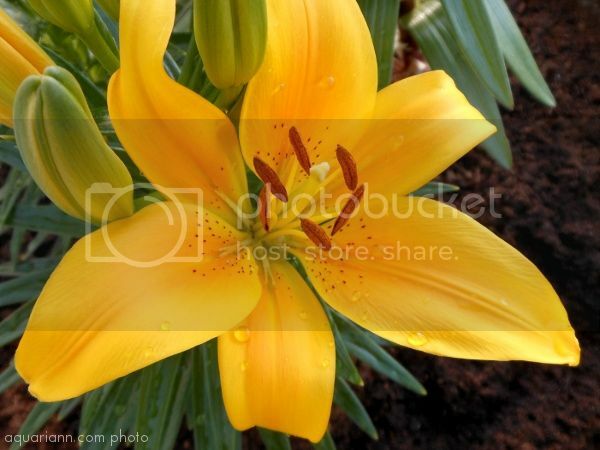 Look at the beautiful yellow lily Ogre planted me to brighten up our back porch! Wow! So beautiful! Thanks for hosting Kristin. So pretty! I love that flowers are coming up. Although in Nebraska it still feels like winter. What a lovely bright blossom! what a gorgeous color! I needed to see that with all the much we are dealing with. no spring lilies here, but I can't wait for my assortment of Asiatics & day-lilies make their appearance. Gosh another super fast week. Love this photo! Have a great week. Lovely yellow bloom. So beautiful. love Love LOVE lilies!! Happy WW!! Gotta love lilies and you have captured this one beautifully! Love the poem too! I am anxiously waiting for my area to warm up enough for my lily's to bloom. Love the color of the flower and the droplets of water on the petals. Thanks for sharing on WW! I love lilies! This is gorgeous! This is such a beautiful flower! Beautiful, Vibrant Yellow! Love it.